The fifth episode of Israel Story is all about sacred bovines! We’ve got four featured moo-ers: a red heifer that some think will bring the messiah, a cow that’s become the symbol of radical Israeli veganism, buffalos that hold the future for a self-described “Israeli redneck,” and the golden calf that was biblical big-business. 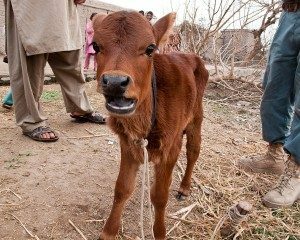 Listen to "Man, I Feel Like a Woman"
Prologue: Do We Have a Red Heifer Today? First, a look at the massive effort to find a red heifer, powered by people who believe such a cow needs to be found before the messiah can come. 269 was originally the number of a a sweet-looking slaughterhouse-bound calf. Now it’s the namesake of 269, a radical vegan movement spawned by Sasha Bojoor, that uses the rallying cry, “Free 269.” Yochai Maital talks with Sasha to trace the origins of 269 and their extreme tactics. 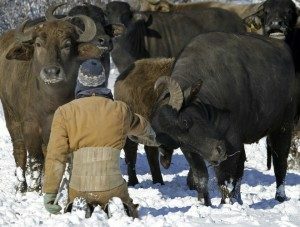 Dubi Ayalon, a retired IDF lieutenant-colonel, traded a life as a school principal in Israel for a life of raising and miking water buffalo in rural Wisconsin. Mishy Harman went to the farm and spoke to Dubi. 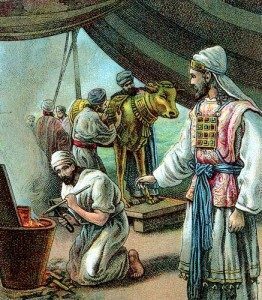 Writer and radio host Jonathan Goldstein offers us a sly and bittersweet interpretation of Moses’ battle against idol worship, told from the perspective of the youngest employee of a golden calf business that faces its fiercest competition yet: God. For music and mixing help on today’s episode, a big thanks to Jonathan Groubert, Anny Celci, and Nathan Bowles. Thanks also to Benny Becker, Daniel Estrin, Karen Carlson, Mihal Davis, Michal Ayalon and Aeyal Raz. Julie Subrin’s our executive producer. Israel Story is produced by Mishy Harman, Yochai Maital, Roee Gilron, Shai Satran, Nava Winkler, and Maya Kosover.